iPad mini, as impressive as the previous generations of iPads, is provided with high resolution, say, 1024X768. So iPad mini is a good choice to watch any kind of video: HD movies, TV shows, podcasts and music videos. You feel completely immersed in whatever you’re watching. Besides, with small body size (7.85 inches screen) and weight, iPad Mini is more convenient to carry out, for example, put it inside the handbag. But have you ever imagined playing DVD on iPad mini? This sounds crazy, because these are two totally unrelated and incompatible things. If we can convert DVD to iPad mini accepted video, we can make good use of our existing DVDs. This article will guide you how to free copy DVD to iPad mini with free DVD to iPad ripper for Mac. iPad Mini partially takes over the technology of previous iPads. So the free DVD to iPad mini ripper you are choosing should at least support ripping DVD to iPad 2. For example, you can try the famous free DVD video encoding software – HandBrake. However, not compatible with copy protected DVDs, HandBrake can only transcode general DVDs. Besides, it requires more expertise on profile settings. (See the latest version Handbrake 0.10.0 review). 1. It can rip plenty of DVDs, including homemade (self-made) DVDs, commercial DVDs, even the protected DVDs with region code, CSS, RCE, Sony ArccOS and UOPs. 2. It is perfectly compatible with Mac OS X Mountain Lion, Mavericks, and Yosemite. 3. It can well preserve the output video as the same as the original DVD by High Quality Engine and Deinterlacing technology. 4. It helps rip DVD to any generations of iPad, say, DVD to iPad, iPad 4/3/2, iPad Mini (4) and iPad Air. With this free Mac DVD to iPad ripper, you can free rip DVD to iPad on Mac and play DVD video on iPad mini on the go. The way to copy DVD to iPad mini for this free DVD to iPad Mini for Mac is very simple. To begin with, you'd download the dmg file on your Mac, open it and insert any of your DVD. Step 1: Click "DVD Disc" (if you have DVD folder on your Mac computer) to import DVD folder. Step 2: Choose "to iPad Video" category and select "iPad mini" or "iPad mini with restina display" as the target device. 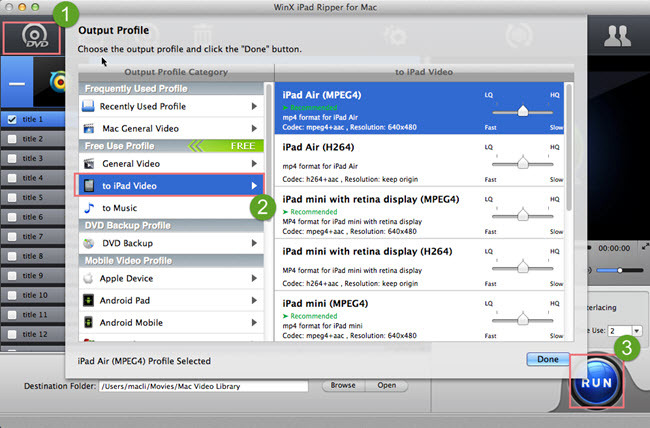 The iPad profiles are already preset by the developer for different iPad types and the default settings are the best quality profile settings for ripping DVD to iPad mini. Step 3: You can then click "RUN" button and rip DVD to iPad mini on Mac for free. Case 1: Thanks for your recommendation of free DVD to iPad mini ripper running on my Mac. I succeeded in ripping my DVDs I bought last year with WinX iPad Ripper for Mac, but it failed when I tried it on the DVD I bought recently, like The Hunger Game. How to solve it? 3. If you want to play back DVD videos on other portable devices, it can satisfy you by converting DVD to iPhone, iPod, Android, HTC, Samsung, XOOM, Galaxy Tab, PSP playable vides. Note: There is also Windows version DVD to iPad mini ripper. Case 2: iPad mini has only little capacity, so it can only bear few converted DVD movies. And I have to delete it after I finish watch a movie. Is there any better idea to avoid it? Solution: Yes, use free audio video streaming software to stream any of your videos (both DVD and other videos) to your Mac without taking any space. DVD to Surface Pro 4: Rip DVD to Surface Pro 4 Easily and Play DVD on Surface Pro 4/3/RT Freely. DVD to MPEG: Convert DVD movie to MPEG format to achieve excellent image/sound quality.